Island Air takes you high above the sea, passing Mount Maunganui’s namesake and Matakana Island. See Mayor and Whale islands beyond you as we make for White Island – the open core of a volcanic chain running through the centre of New Zealand known as The Ring Of Fire.We fly low around White Island to take in its every sight, peering right into the volcanic crater and seeing plumes of smoke, natural gas and steam rising from its core. Bold landforms - with an almost moonscape quality - give way to surreal yellow sulphur pools, several small ‘lakes’ and bubbling mud. See the site where an eruption and avalanche killed a small community and wiped out the once productive sulphur mines. It certainly is a privilege to be peering down on this living, breathing giant. See schools of fish, pods of dolphins and sometimes even the Orca Whale along the way, and return via Te Puke (Kiwifruit Capital of the World) and along our stunning coast. 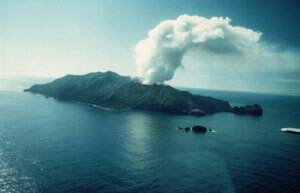 Your White Island tour takes approximately 1 hour 15 mins, from $265 per seat.